WARDJet now offers a new way to increase the capabilities of your waterjet with the option for a 36” Z. 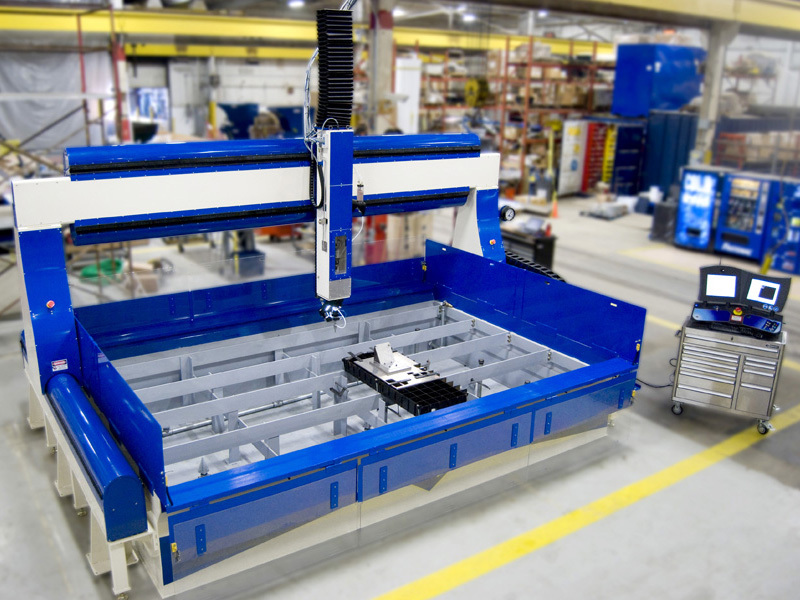 This option raises the waterjet gantry by 3 feet, which allows operators the ability to cut much larger parts on the waterjet system. The 36 inch Z option is available on the Z-Series, R-Series, and previously installed machines. By retrofitting a 36 inch Z-Carriage onto your existing machine, you will be able to cut a greater variety of parts. Another benefit to adding a 36" Z is increased flexibility with a 5-axis cutting head. When installed on a waterjet with 36 inch gantry, the 5-axis cutting head is mounted on the bottom of the Z-Carriage instead of the front. As a result, you are able to cut the entire 36” down the side of an object without having to stop because the Z-Carriage is in the way. For more information about waterjet cutting systems with extended Z axis travel, visit our 36" Z Travel page. • WARDJet Analytics: Get More From Your Waterjet! • Another Z-2043 Abrasive Waterjet Out the Door!